Hosting a Party? Don't forget your Buddeez 1.75 Gallon Party Top Beverage Dispenser. The perfect assistant to any gathering. This dispenser really packs a PUNCH - and can serve while you enjoy time with your guests. 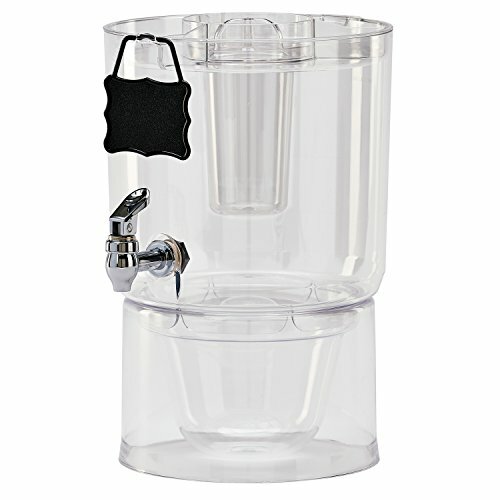 The 1.75 Gallon Tritan dispenser includes: Ice Cone to keep the beverage chilled but not dilute the deliciousness inside, Ice Base/Bucket to chill when used as a base or serve ice when detached from dispenser, Garnish server/lid to hold cups and multifarious beverage edibles including fruit and sweeteners, Hang tag to identify contents and faucet for easy dispensing. These dispensers are stackable for more party fun and drink choices. The Buddeez Beverage Butler also makes a great wedding or housewarming gift. Great for tailgating and picnics too! Use with cold beverages only. Serve cold beverages with style at any occasion with a Tritan, BPA free Beverage server. Features 1.75 gallon Beverage reservoir, ice cone and compartmentalized base that can be used for additional chilling or separately as an ice bucket. Utilize the unique top for fruit and/or sweetener and cups for ease of serving. Includes 1.75 gallon Tritan dispenser, ice cone, ice base/bucket, cup holder, faucet, hangtag and chalk. If you have any questions about this product by Buddeez, contact us by completing and submitting the form below. If you are looking for a specif part number, please include it with your message.